CAIR-NY filed an amicus curiae as part of a group including former Secretary of Commerce, Secretary of Transportation and Congressman Norman Y. Mineta, Joy Sakamoto Barker, Eileen Yoshiko Sakamoto Okada, and Sharon A. Sakamoto, who were incarcerated along with tens of thousands of other Japanese Americans during WWII; the Council on American-Islamic Relations, New York, Inc.; and the Fred T. Korematsu Center for Law and Equality in filing a brief challenging the 2020 census citizenship question. [NEW YORK, NY] joined an amicus curiae group in filing a brief today supporting the challengers in the ongoing 2020 census citizenship question litigation (New York Immigration Coalition v. United States Department of Commerce). The amici include the Fred T. Korematsu Center for Law and Equality at Seattle University School of Law (Korematsu Center), the Council on American-Islamic Relations, New York (CAIR-NY), and four American citizens of Japanese descent whose incarceration during World War II was partly due to the Census Bureau’s cooperation and sharing of data with the War Department. In the brief filed today, the amici argue that the District Court can and should meaningfully review the Census Bureau’s addition of the citizenship question to determine whether it violates the Administrative Procedure Act and the Equal Protection Clause of the United States Constitution. The amici remind the court that absolute deference to the political branches has permitted historical abuses of both individual and group-level census information. Further, they argue that the government’s insistence on such deference relies on a novel, untenable distinction between constitutionally-mandated enumeration and the manner of that enumeration. History shows that the form of the census can meaningfully stunt the quality of its enumeration results. 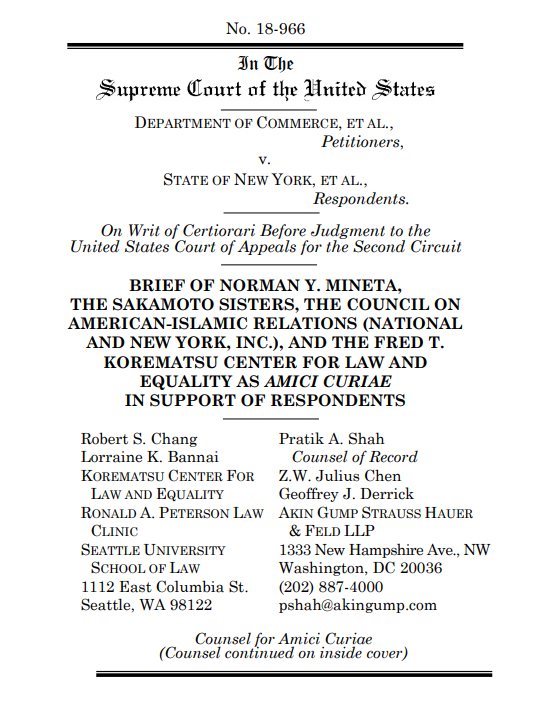 The individuals and organizations joining the amicus brief today are: Norman Y. Mineta, Joy Sakamoto Barker, Eileen Yoshiko Sakamoto Okada, Sharon A. Sakamoto, the Council on American-Islamic Relations, New York, and the Fred T. Korematsu Center for Law and Equality at Seattle University School of Law. Pro bono counsel on the brief are: Robert S. Chang and Lorraine K. Bannai of the Fred T. Korematsu Center for Law and Equality, Albert Fox Cahn of CAIR-NY and attorneys from Akin Gump Strauss Hauer & Feld LLP, including Robert H. Pees, Alice Hsu, Martine E. Cicconi, Geoffrey J. Derrick, Bailey A, Pepe and Elizabeth G. Atkins. 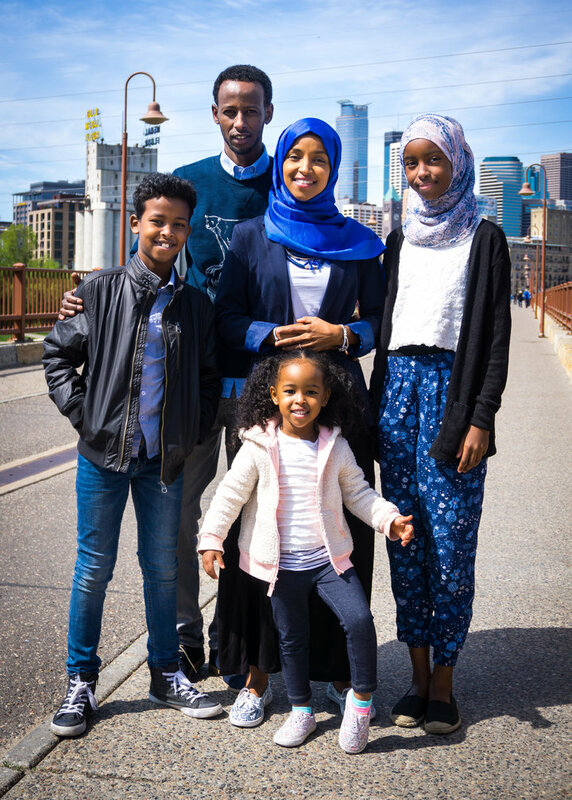 The amicus brief filed in the United States District Court for the Southern District of New York is available at http://www.cair-ny.org/s/Census-Amicus.pdf. The census provisions at issue are questions about the citizenship, country of origin, and naturalization of census respondents. Opponents of the policy, including ten former Census Bureau directors spanning 34 years of service under both Republican and Democratic administrations, note that such questions have not been asked of all census-takers since 1950 and could potentially cause a major undercount of certain communities. 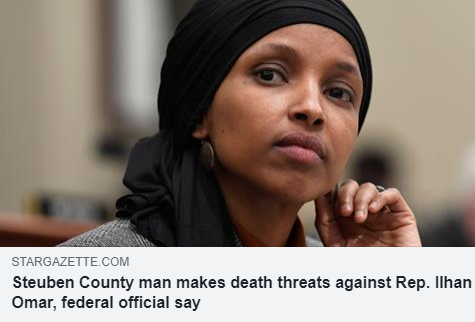 That, in turn, threatens federal funding and representation in the Electoral College for cities and states with significant immigrant populations. The Census Bureau has published internal research showing that the climate of fear created by the Trump administration has increased immigrant concerns about census confidentiality, which may disproportionately impact data quality and coverage of those immigrant communities on the 2020 Census. In the instant case, plaintiffs, including the New York Immigration Coalition, assert that the Department of Commerce’s addition of the citizenship question violates the Administrative Procedure Act and the Equal Protection Clause of the United States Constitution. 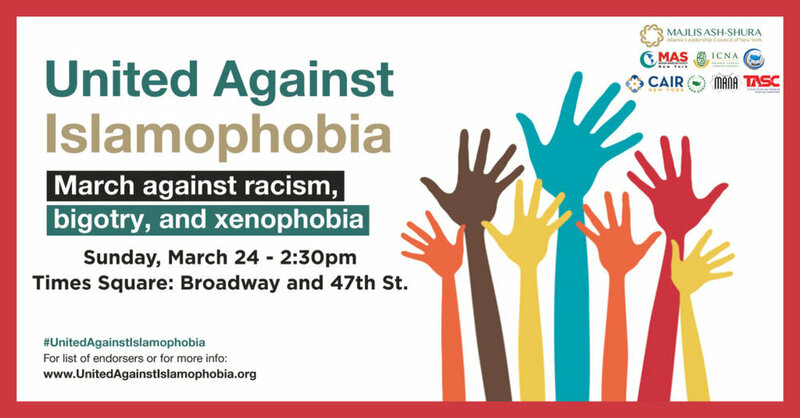 They also contend that the question is designed to function as a tool in the Trump administration’s campaign of hostility and fearmongering towards immigrants and people of color. In its defense, the federal government responded that the court should defer wholly to the executive branch because the citizenship question does not affect the constitutionally required enumeration of citizens. Instead, the government argues that the citizenship question is merely part of the manner of executing that enumeration. The government contends that because the Constitution gives Congress the power to “direct” the “[m]anner” of the decennial enumeration, and Congress has delegated that power to the Secretary of Commerce and the Census Bureau, the judiciary is unable to review the “manner” of enumeration. Oral arguments on a Motion to Dismiss in a companion case, New York v. United States Department of Commerce, as well as discovery requests in both cases, took place on July 3, 2018. At the conclusion of those arguments, Judge Jesse Furman ordered significant discovery for the plaintiffs in the consolidated cases and indicated his intention to rule that at least some of the claims would survive the motion to dismiss. 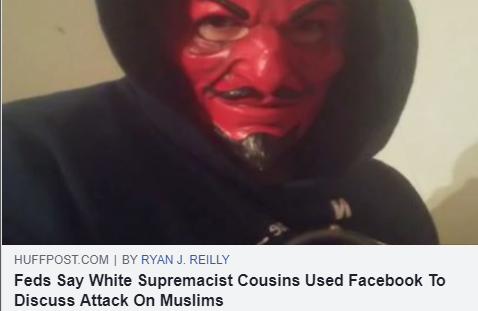 He also stated his finding that the New York plaintiffs had made a plausible prima facie case that the Secretary of Commerce’s justification for the citizenship question – enforcement of the Voting Rights Act – was pretextual.